Oh, that is a mouthful to say. 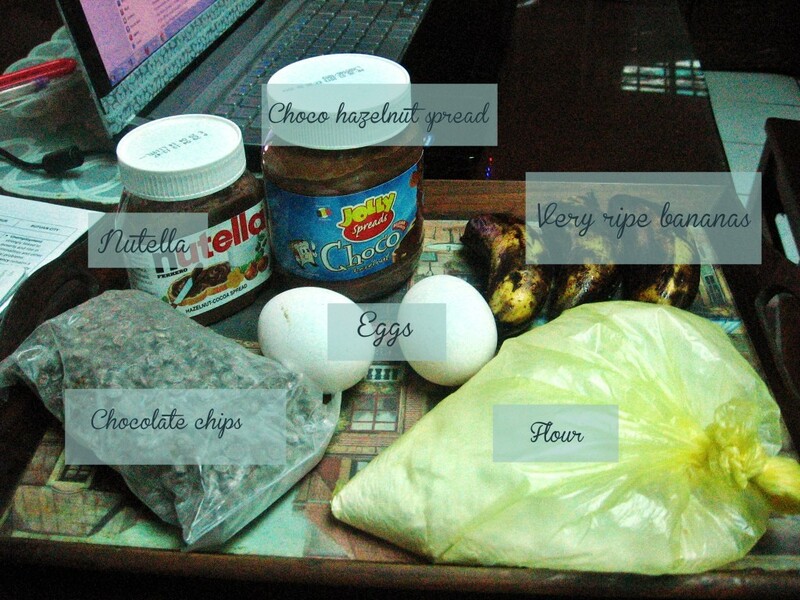 It is because this is a modified version of the 3-ingredient Nutella brownies. My friend shared this recipe on Facebook. Because I am a fan of easy baking where I just dump all the ingredients, I was excited to try this one. You might be wondering why the name change. It is because I modified the recipe. We had overripe bananas lying around and my aunt wanted me make banana bread. So, I chose to use the bananas for this recipe. I also replaced Nutella with the Jolly choco-hazelnut spread. Nutella is expensive for my poor budget. 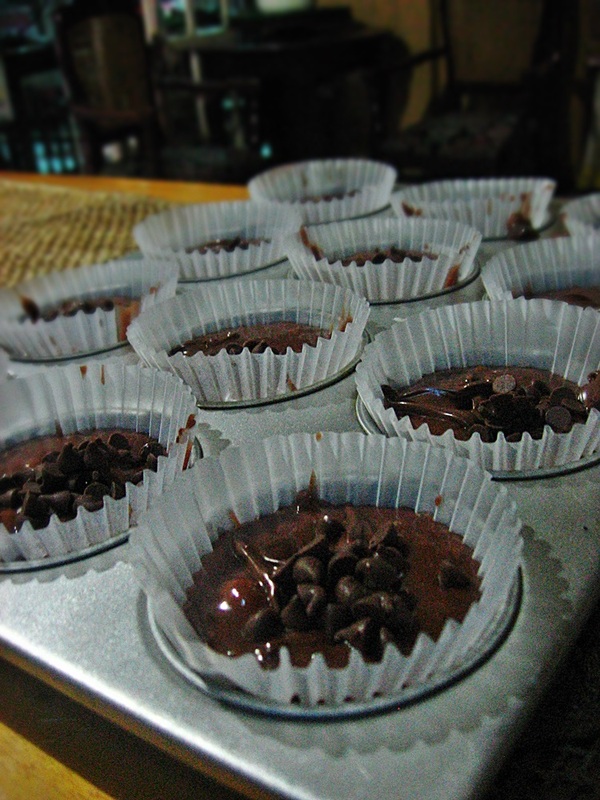 Instead, I used the Nutella as an added topping on the mixture. I also had chocolate chips in the fridge so I took a handful and mixed them into the batter. Here’s what I did. 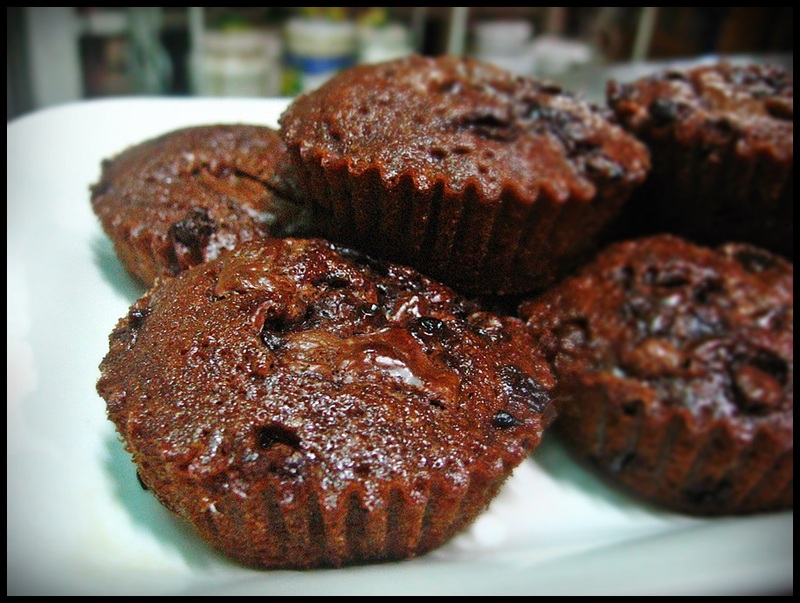 I mixed 1 cup Jolly choco-hazelnut spread with 10 tablespoons of flour and 2 eggs. 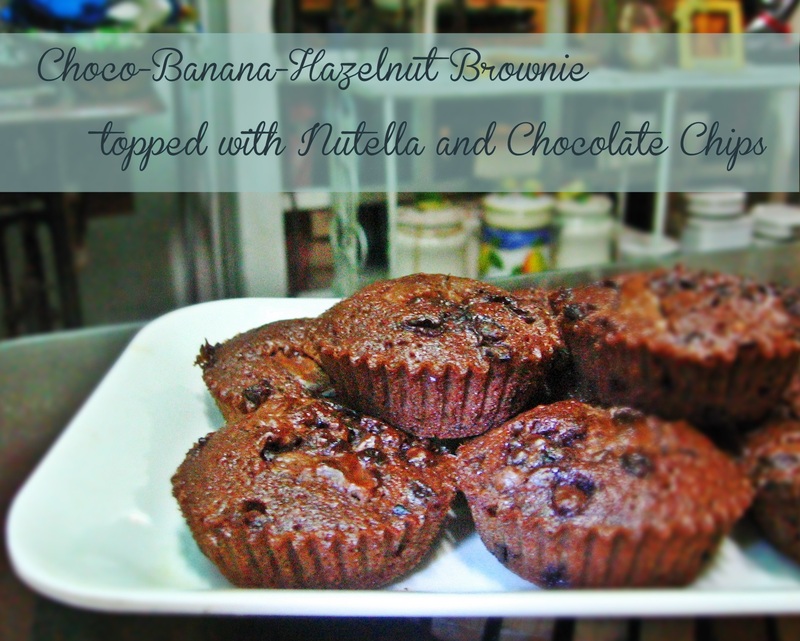 I mashed the bananas and mixed into choco-hazelnut spread-flour-egg mixture. I dumped a handful of chocolate chips. Then, I scooped two tablespoons of mixture into muffin pans with cupcake liners. I topped a teaspoon of Nutella and some chocolate chips. This is what it looks like before baking. Once it was done, I let it cool down and removed the liners. This is the finished product. The people in house says its yummy. 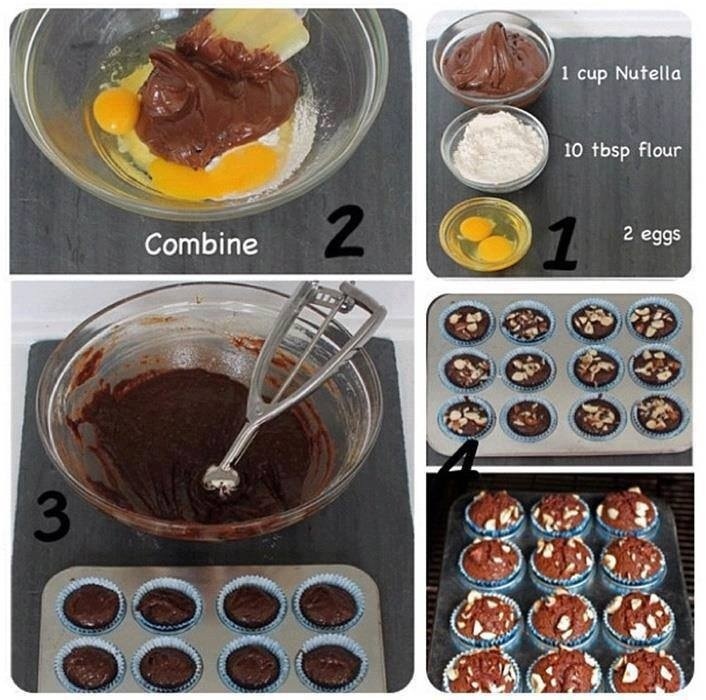 Go ahead and try this recipe! Ohh looks sinfully delicious! Gotta try this. Thanks for sharing. Like you, I prefer recipes where I just mix the ingredients, freeze it, done. Or in this case bake a little. It’s so I can make it with my daughter. 🙂 We’ll try this recipe for our next cooking project. Looks tempting and delicious! pahingi! Wow! 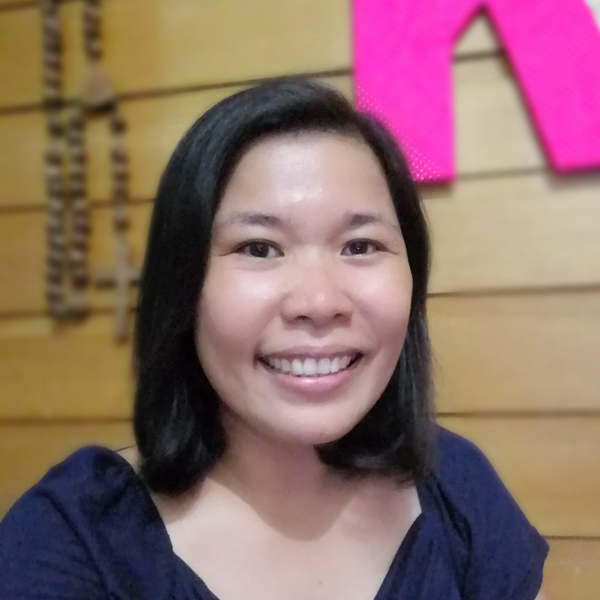 Pwede ka ng mag negosyo, Sis! 🙂 I bet it tastes really good. It looks yummy. Nakakagutom tuloy. I will try that Jolly choco-hazelnut spread nga 🙂 When we have oven na, I will bake na with of course Daddy Allan. Oh, mine is a hit and miss thing. Sometimes, there are burnt batches! It sure looks yummy and easy to make. But nutella is way over my budget, too. Good to have some alternatives from the market. that sure looks so yummy! made me really want to have an oven at home. btw, love your blog’s new look! uy, napansin niya. will still need to tweak a little. add some details.